Meeting started 19.35 hrs, Whitby Rifle Club. Apologies received from Dave Johnson (Honorary) via email. 19 members in total, another excellent turnout, well done and thank you for taking the time. As last year, Honorary Chairman William Atkinson brought the meeting to order and thanked everyone for coming. He went on to thank everyone, but not everyone who heeded his request to respect a dress code for the Annual Presentation night. Rob Allison was singled out for his exceptional attire. Secretary Peter Horbury asked for a proposer & seconder to confirm the minutes of last years AGM as a true account (all members who attended last years AGM had received copies in the post two weeks prior to this years meeting). Honorary Chairman William Atkinson thank the officials for their continued efficiency in the smooth running of the club in his absence, as he had not been able to fish as often last season as he had done in previous years. In return he was thanked by the members. A. Please be aware the Code of Conduct for Bempton Cliffs has been amended as of 13th May 2014, there is no fishing permitted after 28/29th February. Bempton falls within our club boundaries and therefore we, as a club, must follow ‘the code of conduct’. Note also this is a ‘voluntary code’ and if abused, I have been told, it will be made law and the land owners could deny all access to anglers. B. Iron Spring – it has been brought to my attention that the farm house above Iron Spring is being renovated by the owners. They have made it known (via Rob Taylor & other members confirmed during the meeting) that there is no parking for anglers as all space is required for deliveries & tradesmen working at the property. C.	Open registered for Penn points with Alan Yates at Sea Angler magazine. D.	Clubman series run by Alan Yates at Sea Angler magazine – names to be registered for those interested in taking part and teams based on last year’s rankings. E.	Web site doing well, 87,557 views this time last year has increased to over 234,000 views this morning. F.	I have taken advantage of an offer from our web site provider, renewed & secured the web site domains for the next 9 years at a cost of £188.09. Giving an average annual cost of £20. G.	Dave, Bernard & I, have had a meeting with Carla Smith, landlady at the Fleece. We are welcome on Wednesday & Sunday nights. Our Treasurer, Dave can confirm Carla Smith i.e. the Fleece will be sponsoring our Open match on Sunday 23rd November 2014 – more detail later. H.	Food can be warmed and served at the bar on Wednesday nights. I.	I (Peter Horbury) have donated a pewter tankard as a new WSAA trophy for 'Heaviest Fish Aggregate'. In order to qualify members must of fished 76% or more of the seasons matches. If it were a 49 match season, then 37 matches must have been fished, increasing by 1 every sequential match season year. 49=37, 50=38, 51=39 and a 52 match season, 40 matches must of been fished. J.	I would like to thank all those who helped throughout last season with the weigh-ins, our Open, be it supervising the weigh-in, selling raffle tickets, collecting prizes & sponsorship. It all helps, and to those who volunteered for match report photographs. K.	James Moore has again donated £100 sponsorship to the open – many thanks to James. L.	Mrs P Pitman & Mr M Pitman have again pledged prizes from both shops and fishing boat, and have agreed to sponsor the Christmas match again. Many thanks. M.	Wilf Nobles Construction & Plant Hire, Ruswarp, Nr Whitby is to sponsor the 1st place prize of £500 for the Open. Many thanks to James Noble, and Iain Simpson for securing. N.	Any sponsorship gained by members, please let me know ASAP so I can get the sponsor on the web site. Was presented by Dave Perrett and confirmed as true James Gilpin, and seconded by Peter Horbury. Honorary Chairman William Atkinson proposed James Gilpin, seconded Dave Hambley. Carried. William accepted but could not guarantee being at every match, but was only a phone call away. Treasurer Dave Perrett proposed James Gilpin, seconded by Peter Horbury. Carried. Secretary Peter Horbury proposed Bernard Vasey, seconded Rob Allison. Carried. Honorary Club President William Atkinson unanimously carried. Wilf Noble for Vice President – Iain Simpson to approach & report back. Andrew Cass confirmed he had asked his father, Dave Cass who had accepted. No change from last year (as above). Neil Inglis said yes to continuing as a Committee member ‘but’ admitted he may not be able to fish all season but would be available if called upon. Dave Perrett confirmed the insurance £3 was enough to cover the WSAA policy. As yet, he confirmed, there was no ‘Individual’ insurance policy previously mentioned for non-club members. Proposed to stay the same Bernard Vasey, seconded James Gilpin. Treasurer Dave Perrett, asked that, like in previous years for the 1st match (meeting at Bandstand Wednesday 1st October 2014), that members subscriptions and match entry fees be put in a named envelope with at least 4 match entry fees. Rob Allison would be on hand to receive the £2 for those wishing to enter the monthly Heaviest Fish & Heaviest Bag competition. Should he be unavailable then Dave Hambley has agreed to deputise in his absence. A check list will be on hand at the first match when we meet at the Bandstand. Christmas match 21st December 2014 – Everyone agreed the hospitality at the Stakesby Arms was excellent and asked Dave Perrett to approach them for a booking this year. It was asked if the club had received the insurance money for the water logged electronic weigh scales – lost in last years flooding during the tidal surge. Dave Perrett had not heard from neither Stormie Coulson nor Richard Nattriss. Peter Horbury said he would text Stormie Coulson and start the dialogue there. See Note 1 at bottom. Christmas break – Dave Perrett consulted the tide table and confirmed the last match would be our Christmas match Sunday 21st December 2014, resuming on Sunday 4th January 2015. It was proposed to stay the same at £2/match but a number of alternative proposals re how the prize fund is divided were put forward for a fairer and even spread of the winnings. 2)	William Atkinson proposed Heaviest Bag, Heaviest Fish and 2nd Heaviest Bag. 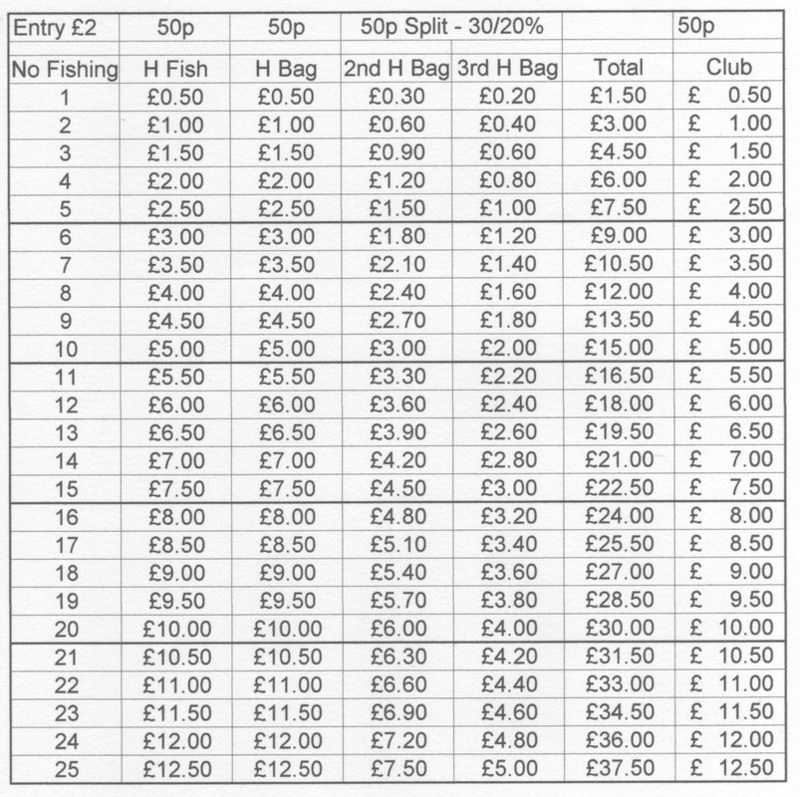 3)	Dave Perrett proposed 25% ie 50p to club, 50p to 1st Heaviest Bag, 50p to Heaviest Fish, and then 50p split (30/20) between 2nd/3rd Heaviest bag. After much discussion and the Chairman’s intervention for order (a common theme throughout the evening), Dave Perrett gave an example in monetary terms as to how his system would pay out if 20 anglers fished. Both Neil Inglis and William Atkinson warmed to Dave Perrett’s proposal and it was carried unanimously. See payout sheet at bottom. Day matches i.e. Bell Trophy to stay the same Heaviest Bag & Heaviest Fish and the winner of the HB cannot take both ‘unless’ he is the only one to weigh-in. To stay the same as last year, again due to the kind sponsorship of £100 for the Christmas Match by members Mrs Paula & Malcolm Pitman of Hook, Line & Sinker and Whitby Seafishing Supplies. And £25 for Heaviest Fish. Confirmed as Sunday 23rd November 2014. Dave Perrett confirmed the Fleece sponsorship of £200 less £50 charged for the food, making £150. James Gilpin to speak to Keith’s Sports but would not be a problem as they had already spoken. Rob Allison to speak to Thompson’s Diggers. Dave Perrett confirmed Smales through James Verrill at Mariondale Fisheries, Robinhoods bay. * see Note 2 at bottom. Open fishing times 10am to 4pm. Colin Stainthorpe proposed the weigh-in times be brought forward 15 mins. It was pointed out that the ‘scales’ open once James Gilpin & Bernard Vasey arrive back from fishing as it takes two to carry out the task as weigh masters. There was no seconder – weigh-in times to remain the same. Entrance fee £12 – Treasurer Dave Perrett was asked his opinion as to the finances, and replied with the current pledged sponsorship, in-line with last year, there would be no need for any increase. Proposed to stay the same by James Gilpin, seconded Rob Allison. Carried. Dave Perrett confirmed Pete Halder would be supplying meat vouchers as WSAA sponsored £50 towards a Scarborough Festival night match. Mick Beedle very kindly increased his sponsorship of the Heaviest Flat fish to £75. This is to split £50 for 1st place and £25 2nd place. Last year it was £50 for the heaviest flat fish won by Club Secretary Peter Horbury. Many thanks again. Ben Laws of Java Café confirmed £50 for 17th place, same as last year. Thank you. Junior sponsors – Rob Allison, Dave Hambley, James Gilpin, Andrew Cass and Colin Stainthorpe all donating £20. Giving a Junior prize fund of £100, as last year. If not won then it is returned to the sponsors (as in previous years). Rob Allison ask for confirmation of the WSAA rule re-juniors. A junior member is classed as under 17 yrs at the start of the season, but if their 18th birthday is before the Whitby Open, then they fish the Open as a senior. It was a fact that in 2012 Paula & Malcolm had not been allowed to sell tickets when Whitby Angling Supplies was a sponsor. In 2013 when Whitby Angling Supplies were themselves ‘not’ a sponsor they (WAS) were granted permission to sell tickets, with ‘no’ complaint from Whitby Seafishing Supplies. At the time of the 2013 Open they (WAS) ran out of tickets but did not direct anglers to Whitby Seafishing Supplies but insisted on extra tickets which were supplied from Whitby Seafishing Supplies without fuss by Richard Deadman who was managing Whitby Seafishing Supplies for Mr & Mrs Pitman. James Gilpin pointed out that all shops selling Open tickets were clearly marked on the Open posters. Mick Beedle asked if Whitby Angling Supplies did anything for WSAA, when told no, he proposed that Paula’s request be granted, seconded James Gilpin. Carried unanimously. Open Match meeting was either to be on Tuesday 14th Oct or Tuesday 21st Oct, William Atkinson left the room to consult with the bar staff. On his return he confirmed Tuesday 21st was booked for the meeting at 8pm. Mrs Pitman, as a committee member, submitted her apologies in advance of this meeting, as they will be on holiday – recorded. Peter Horbury asked if anyone would like to volunteer for organising this club event, as he had done so for a number of years. Mick Beedle proposed that Peter Horbury continue to do so, seconded by Paula Pitman. Carried. Mick Beedle offered 2 new trophies (for as long as he is a club member) for the Knockout Runners-up. Singles knockout to start 3rd Wednesday in October 2014 being the 15th. Dave Perrett made a suggestion, in order for the singles final to avoid being fished in the lean month of January. He proposed that should there be (and there invariable is) any preliminary rounds for ‘both singles and doubles knockouts’, that they both be fished on Wednesday 15th October so that the 1st round proper of the singles starts on Wednesday 22nd October and the doubles on the 29th October. Then falling into the 3 weekly cycle. Seconded by Peter Horbury. Carried. Proposed to stay same by James Gilpin, seconded by Bernard Vasey. In order to speed things up with gathering names for the knockouts, names could be taken now at the meeting. On the first match of the season names for those who are not at the meeting will be taken for entry into knockouts. Paula & Malcolm Pitman along with Rob Allison and William Atkinson gave notice they would not be entering but everyone else at the meeting would be. Heaviest Fish & Heaviest Bag of Fish of the month sweeps, confirmed earlier that Rob Allison would organise with Dave Hambley as his deputy. Entry fee £1/£1 would remain the same. Christmas match 21st December 2014. Fishing 2-7pm and the weigh-in 7-8pm. Venue - Stakesby Arms - Dave Perrett to confirm. Entry fee £10 proposed by Neil Inglis, seconded by James Gilpin. Andrew Cass to bring back the Capital Child Trophy so it can be re-used every year. Agreed with Mick Beedle who donated the trophy last year. 1)	Again during this heated discussion and not for the first time Chairman William Atkinson called for order as too many noisy mini meetings were taking place. A heated, but good discussion took place with a number of alternatives put to the floor on a topical subject proposed by Andrew Cass – Club Boundaries. With the loss of The Gare members pointed out the WSAA boundary was more lob sided to the south. Whiting bashing had been unpopular with the ‘cod’ anglers, always a bone of contention, hence why the HB/HF was reintroduced last season. Some anglers don’t like heights so fishing off Bempton in the lean months was seen as ‘unfair’. Finishing work at 5pm on a Wednesday night meant that travelling to Bempton a non-starter making members reluctant to fish locally when conditions were flat calm knowing those at Bempton would have a better chance of fish. A totally open boundary was discussed with ‘time’ being the restraint. But all agreed no one was breaking any rules and everyone was here to fish for whatever could be caught within said boundaries and fish sizes. Again Chairman William Atkinson called the meeting to order with proposals being put on the table. A)	Boundaries to be the same as the Open Match – Skiningrove Beck to Coble Landing, Filey. Proposed by Andrew Cass, seconded Paul Short. B)	Re-opening the boundary to what was – The Gare to South Landing, Flamborough. Dave Hambley proposed, seconded by Ben Laws. C)	The boundaries stay the same Saltburn Pier to South Landing, Flamborough. Mike Bowman proposed, seconded by Peter Horbury. With three proposals on the table every member could have one vote and one vote only on any one of the three proposals. Secretary Peter Horbury said he would record each name of those voting for each proposal in order to see fair play, James Gilpin assisted in naming the voters so they could be recorded. A)	8 votes - Boundaries for the 2014 – 2015 Season to be the same as the WSAA Open Match – Skiningrove Beck to Coble Landing, Filey. 18 votes in total and Chairman William Atkinson’s vote was not needed as there was no tie. 2)	Andrew Cass reported that his father, Vice President, Dave Cass, had found an original club badge which he would show Secretary Peter Horbury. Many thanks for all for attending and tight lines for the 2014 – 2015 Season. Note 1 - 23rd September 2014 - Richard Nattriss has given WSAA £50 to replace the electronic scales lost when the tidal surge flooded the cellar of the Fleece in 2013. Many thanks. Note 2 - Smales will not be sponsoring the WSAA Open. Last edit Wednesday 28th May 2014, Friday 5th September 2014, 1st October 2014.